I've got a 96 trans with the same issue, I've checked a lot of similar stuff, and my final nail in the coffin was checking the OD test port for pressure. Its the only one on the drivers side of the trans I believe, its a 1/8 npt plug just in front of the OD housing. Mine only gets about 10psi. which to me means likely the OD lip seal is blown out as its not building pressure. I would recommend testing your pressure at that port, that'll tell you if the solenoid and everything is working, which it does sound like it is. If it ends up being your lip seal, they're cheap and if you have 1 2 and 3 just not 4th then your od direct clutch is fine so you shouldnt have to mess with the killer spring, you can remove just the od housing, replace the 2 lip seals and od housing gasket and od brake clutches without removing the rest of the trans, that's what I'm about to embark on with my 96/01 abomination. EDIT: Also, yeah fix those cooler lines, its not fun having one blow apart when you're going down the road. I did all 1/2 flex line over barbed fittings on my 97 truck, works great, no more leaky connections and weird hard line to soft line connections that came apart repeatedly. My local auto parts store was concerned when I bought them out of ATF +4 twice in the same week. Red Truck: 97 2500 4x4 ECLB 250k-ish, mostly stock. Purple Truck: 01 1500 4x4 ECSB 12v Conversion, has all the 1996 3/4 ton stuff besides the body at this point. Thanks! I’ll definitely give it a try. Hopefully this will do the trick. How many PSI does a healthy od port read? And yeah keeping it full of atf ain’t cheap! Edit: Found it! 5-10 psi at anytime in drive and 80-130psi when trying to shift. And according to the same thread, grounding the solid brown wire at the pcm should through it into od. What type of gauge did you get? I asked at the parts store and they said they’d never heard of anyone testing the pressure in a transmission. Not really something the average Joe does. A quick check style mechanical oil pressure gauge is the same thing, I bought mine off Amazon. Make sure it comes with 1/8npt adapters. Something like this (I hate to suggest HF, but it's an example) or this. I think Lisle used to make a nice, relatively inexpensive set - but I can't find it on their site (maybe it was KD Tools, which is no more). Advance Auto Parts has one by A&E, and there's probably about a million others out there. Check the length of hose for the gauge to be sure it will reach up to where you can read the gauge. Awesome, thanks! I’ll pick a set in the morning. I have that exact OTC set, got mine on amazon though, that 2 day shipping gets me every time. shows 68-72psi in 4th with foot off throttle, rising to 90-120, maybe even as high as 130psi full throttle. Mine stayed around 5 and raised to about 10 when I was mashing on it. Obviously not enough to compress the killer spring and engage that OD brake clutch. Thanks Jarod! That’s a helpful manual page. Before I drop the pan I will still hook up a gauge. Would a bad pressure solenoid cause pressure to read low at the 4th gear port? 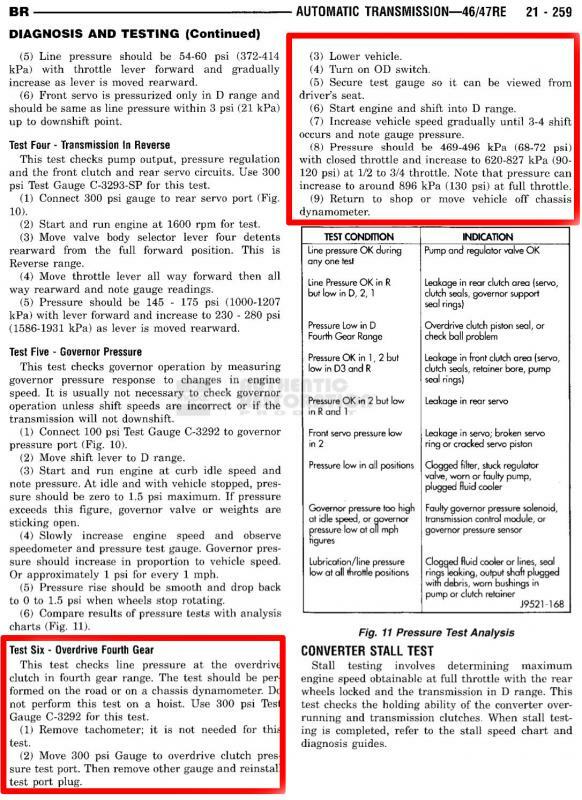 I'm far from an expert, but I would question their knowledge, as I'm fairly certain the 47re has no way to check pressures via OBD2 to begin with. I certainly know I've not had access to a scanner that would show me much of anything on my trucks. Maybe 98s have more electronics, but you have a 97, and I have a 97 and a 96 so I'd think we've basically got the same stuff. The transducer and solenoid are notorious for doing weird stuff but if your 1,2,3 and lockup is fine (with od off button lit up) and you have no slippage in those, I'd look elsewhere. 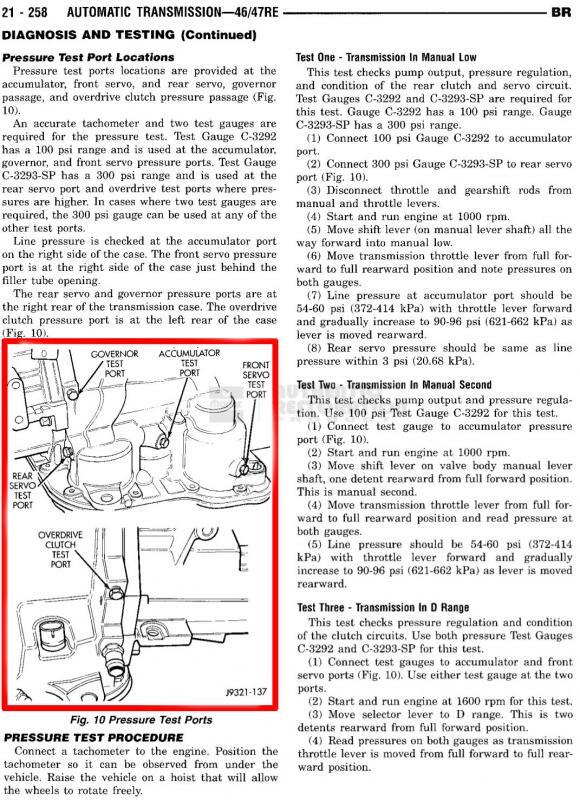 Take a look at the little chart on that page I posted, you can check at the governor pressure port to see if the transducer and sensor are regulating properly. Yeah, I got the vibe they weren’t as sure of what they were reading of the scanner as they lead on. I definitely will and thanks for the manual pages! I picked up a pressure gauge this evening and will test it in the morning if the rain lets up a little. I hope they’re right though! Seems easier and cheaper to through in a governor solenoid than a lip seal or piston seal. Yeah, I'd rather do a Gov solenoid and sensor any day, but with my purple truck project I've ruled out most everything but that lip seal. On the plus side, since I've got 1-2-3 and lockup all healthy with no slippage just no OD at all I don't have to drop the entire transmission, just the OD housing, which is still far more of a chore than dropping the valve body but at least I don't have to unbolt the converter and all that mess. There is service manuals available on here for free! I figure posting the specific pages saves you some time trying to hunt through it all since I've already been through all this recently its fresh in my mind. The 96 one is most applicable for our trucks. Keep us posted what you find out, I was always terrified of automatic transmissions, but I'm starting to see how simple they really are once you get past thinking its all wizards and fairy dust inside the thing.